It's shaping up to be a big summer for movies. That's welcome news for exhibitors, which sold just 1.26 billion tickets last year, the industry's lowest tally in nearly 20 years. Large audiences may not be so great for moviegoers, and not just because there's a higher chance that you'll be sitting in front of a habitual seat-kicker or just down the aisle from that guy who won't stop talking about upcoming plot points. A rebound at the local multiplex could lead exhibitors to inch ticket prices higher, again. Let's get ahead of that trend by pointing out a few ways to save some money at the movies this season. 1. Get In for Free. Studios often host free screenings of movies just before they actually come out. Hollywood does this to gauge audience reactions, but also to begin generating buzz ahead of the national premiere. We live in the age of social media, and it seems as if you can't set a hashtag trending soon enough. How do you get into an advance screening? It helps to get connected to sites including Gofobo and AdvanceScreenings.com that list upcoming showings in your area. Some movie studios even have their own programs through which registered users get sent passes for advance showings, including Sony's (SNE) SonyScreenings.com. You can also follow different studios or movie-centric public relations firms on Twitter. If you do manage to get your hands on a free pass, keep in mind that the studios overbook under the assumption that many people won't show up. You will want to arrive early, since the passes are only good until the theater is at capacity. 2. Go Early in the Day. A popular trick is to check out a movie early in the afternoon. Matinee prices are often lower than evening tickets. This is also a good idea if you're trying to avoid crowded theaters, but some chains have plans that can save you even more. AMC Entertainment (AMC) offers A.M. Cinema at some of its locations, where movies that begin before noon -- typically on weekends and during peak summer and holiday periods -- are even cheaper than matinees. 3. Warm Up to Rewards Clubs. Most of the leading chains have loyalty clubs through which frequent guests can rack up points that can be exchanged for free or discounted admissions or concessions. Regal Entertainment (RGC) has the Regal Crown Club and it's free to join. Cinemark (CNK) has a program called CineMode available on its smartphone app, where moviegoers can earn coupons. AMC has AMC Stubs. It's not free: It will set you back $12 a year. It offers reward rebates -- $10 in ticket or concession credits for every $100 spent -- but it also offers a neat perk at the concession stand. AMC Stubs members get their soda and popcorn orders automatically upgraded so large sizes are charged at the medium-size price. 4. Just Say 'No' to 3-D and IMAX. There's no denying that 3-D specs or super-sized IMAX (IMAX) screenings raise the bar on the moviegoing experience. However, the same films are typically offered at the same multiplex as traditional screenings for a few dollars less. Unless it's a special effects epic along the lines of "Avatar" or "Gravity" that begs to be watched in an immersive experience, there's no shame in going the cheaper route. 5. Conceding Concessions. 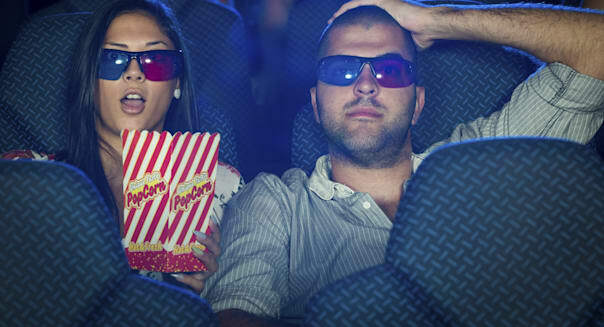 It's easy to suggest that you should sneak in your own snacks to enjoy during the movie given the sky-high prices charged for concessions, but that's against the rules. You can get tossed out for cracking open a can of soda or hiding a Kit Kat bar in your pocket. It rarely happens, but as a private business, the exhibitors are the ones that make the rules that they can enforce as long as you're a customer. The best legal tip to offer is to make smart decisions at the concession stand. You don't need to order a soda, as most theaters will provide you with cups that you can fill at a water fountain. If you happen to be at a theater that offers free refills on large soda or popcorn purchases, there's no harm in asking for a refill on the way out to enjoy at home or wherever you're off to next. You can also eat before a movie so you are less tempted to load up on overpriced snacks. Approach the concession stand cautiously, and you don't have to break the bank the next time you're at the corner multiplex. Motley Fool contributor Rick Munarriz has no position in any stocks mentioned. The Motley Fool recommends and owns shares of IMAX. Try any of our Foolish newsletter services free for 30 days. Is your portfolio ready for a change? Check out our free report on one great stock to buy for 2015 and beyond.